I’ve never been particularly mountain bikey. My only real mountain bike is the one I still have from 1995, a steel 26” affair with mismatched rim brakes. I don’t know an enduro bike from an all-mountain from a down-country, but I sincerely hope the latter involves Nick Cave, a cowboy hat and lots of reverb. I’d be okay with that. I generally assume if I’m riding on a trail, I must be trail riding. If ‘all-mountain’ riding is a thing and I only ride half the mountain, do I get a pass for ‘partial-mountain’ riding? So many questions. So few definitive answers. The legendary Ape Canyon and Plains of Abraham trails on the south side of Mt. St. Helens had been on my seasonal to-do list for some time. So when the opportunity presented itself, I had a bit of a quandary landing on the right bike for the terrain. 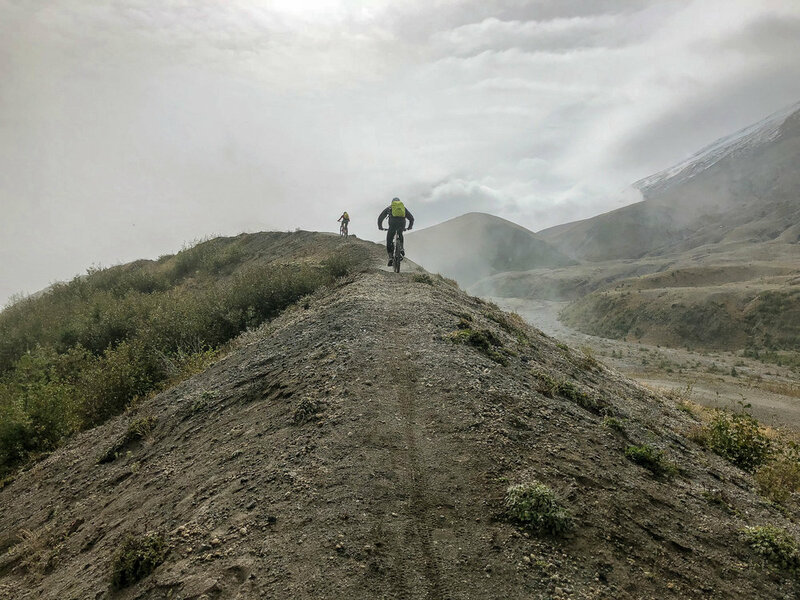 What is the optimal bike for this relatively short but otherworldly out-and-back that gains 3289 feet over 19 miles navigating pyroclastic rubblefields of volcanic debris? I suppose it depends on who you ask. Some claim to have done it on CX bikes. Some guarantee that anything less than full-suspension will result in utter disappointment. I’ve heard mention of fatbikes. Others have warned the abundance of rocks made 2” tires feel like 25c. Opinions on the subject seem to be all over the map, the crux being that bigger would most likely be better. Ultimately I opted for a carbon hardtail plus. (XL Specialized Fuse) Plus, in this case meaning 3” tires. I’m a little fuzzy about the cutoff between standard and ‘plus’ mountain bikes, like I say, I’m not particularly well-versed in the technicalities, but I imagine it’s somewhere between a 2.4/2.6” and 2.8” tire width, which amounts to quite a range in terms of handling, weight, traction and rolling gravity. Anticipating that this route is just as much about the up as it is the down I didn’t feel like full suspension would be necessary or really even advantageous here. Personally I like to feel the terrain a bit and appreciate having to make critical line choices. Additionally the route is reputed to have a fair amount of punchy climbing, loose and rocky up top and smooth, fast dirt down below, so I felt like the hardtail was a reasonable choice. My two compatriots are riding carbon 29ers with full suspension and are well-versed in the particulars of shock calibration, dropper posts and spring rates. I imagine their descents will be quite a bit faster and smoother through the rough stuff. Only one way to find out. First we climb up, then we ride back down. Easy, right? It is the first week of October. Definitely chilly. The high country is beginning to dip into the low 30s. No snow yet, but it won’t be long. Prepping for wide temperature swings can be a bit of a challenge, particularly at high elevations with lots of exposure. It is invariably better in these cases to have the gear and not need it than to need it and not have it, so with that in mind I opted for some extra layers and gloves. Fortunately I was able to mount my frame bag into the hardtail’s front triangle using a set of anything-straps. Between that and a fanny pack there was plenty of capacity for gear and nutrition without having to use a backpack. The dropbar devotee in me gets squeamish at the thought of riding with a backpack, so I tend to offload to the framebag or fannypack out of habit. Settling into the climb, we weave through dense mix of majestic evergreen and intense yellowing foliage in seasonal transition. 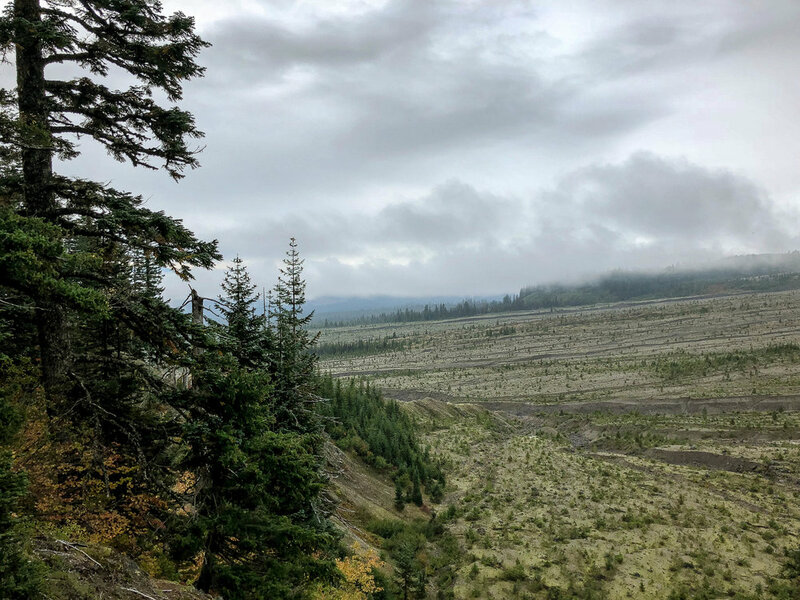 The trail surface is covered with a thin layer of piney duff as we ascend along a narrowing ridgeline providing occasional glimpses westward to the massive Muddy River lava flows below. The first thing that strikes me on the climb out of Ape Canyon is the traction available with plus tires. It is absolutely absurd. To the trail’s credit, the dirt on this particular day was in exceptional form. A slight tack. Moist but not wet. You know, the mountain bike equivalent of ‘warm and punchy’. Between the hero dirt and the extra cush, I’m able to climb with a traction that is entirely new to me. Even in the steeper grades and hairpin switchbacks, it doesn’t seem to matter where my weight is centered. 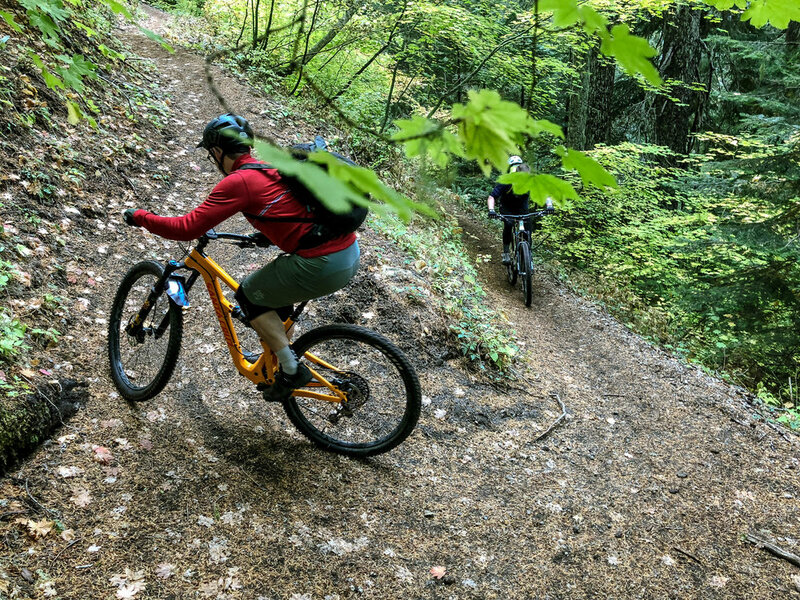 Spinning seated or up out of the saddle, it feels as if the bike is somehow magnetically connected to the trail surface. So far so great. One thing that has never felt right to me is climbing out of the saddle on flat bars. It feels awkward and inefficient compared to the reach, angle and hand positions afforded by drop bars and brake hoods. This sensation is, of course, compounded by the trend of running incredibly short stems, putting the bars effectively in your lap on standing climbs. Fully aware that most mountain bikes are optimized for descending, I still feel like I prefer a bit more reach all around. My hands begin to cramp slightly and I can feel the pressure in my wrists before long. Understanding that this is just a fact of life on mountain bikes, I chalk it up to something I will need to get used to. It’s not that we haven’t seen pictures or didn’t know what to expect, but the reality of standing face to face with this magnitude of immensity is difficult, perhaps impossible to understand in human scale. You can see the mountain yet are viscerally aware that you are on, wholly immersed in and simultaneously part of the mountain. Upon leaving the treeline there is a sense that one is crossing into rarefied space. Entering the pumice plain, the advantage of the plus-tire format become immediately clear. The high-volume tires float over the rubble, softening harsh lines, conforming to loose, uneven features and enhancing traction through the sandy, ashen trail surface and jagged embedded rock. This is good because there is a lot of it. A family of mountain goats charges past and disappears into the mist. 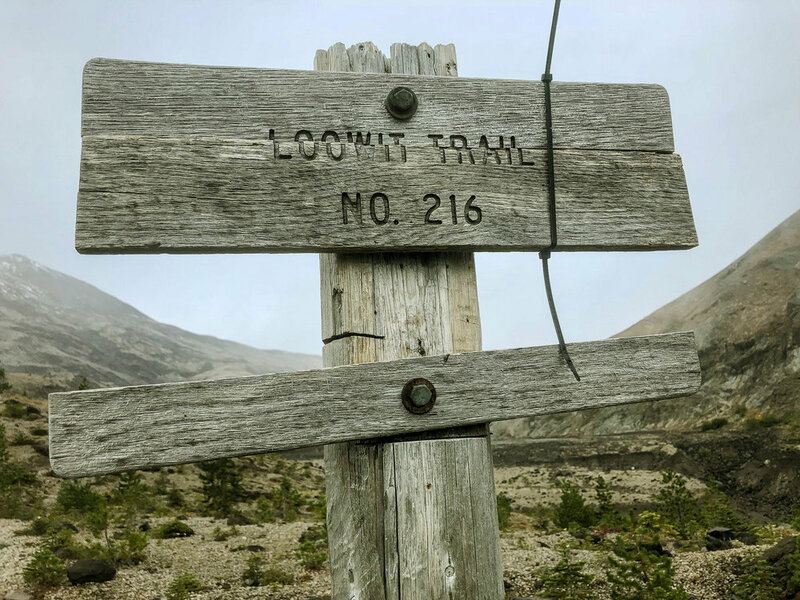 The trails climb upward through a colorful series of exquisitely rippled and undulating drainages between the East Dome, Ape Glacier and Pumice Butte features. A rhythm sets in. Huff it up and out around the edge. Tuck in. Settle into the fold of the next drainage. Descend. Navigate gurgling creeks and rock features. Climb back out. Repeat. Stop. Take it all in. Try to make sense of what we are seeing. Take a few pictures. Wait…go back. This time come around the corner out of the saddle. Yeah. Just like that. Good. Amazement is hard to keep in check with a ride like this, but we try our best. The plain dips, rises and ripples, ultimately focusing into a series of rounded humps descending northward along St. Helens’ southeastern shoulder in the shadow of Windy Pass. Fortunately for us, the trail runs along the crest, rising and falling like a roller coaster circumscribing the spine of a brontosaurus. Rarely have I felt a bike and terrain so ideally matched as today. Some days you just get it right. The more I let it rip, the more the float-factor and control of the plus-size tires kick in. It helps that the ashy trail surface is a bit damp and holding together tighter than I imagine it would mid-summer. Superior traction notwithstanding, the north end of the Abraham Trail drops into a series of impossibly steep sand-chutes and ladders before reaching the graded gravel of NF99. So THIS is why is people have dropper posts. Okay. I get it now. It strikes me as a bit odd that a mountain bike trail has been routed through some of these sensitive erosion-prone areas. We’re talking gradients in the +/-24% plus range. Deeply furrowed channels run down either side of the steep sand ladders. 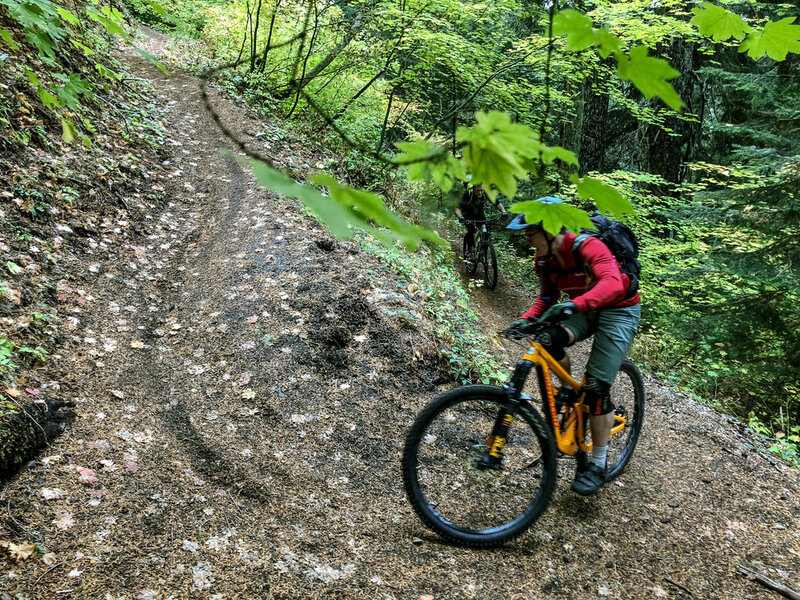 We feel bad contributing to the rutting but it’s kinda the only way down that doesn’t involve navigating an insane series of stairs, so what’s a rider to do? Drop the post, hold on tight and try not to skid. It’s the best we could come up with. It feels a bit anticlimactic finding ourselves on NF99. It is two more miles of compressed gravel to the Windy Ridge viewpoint. The weather seems to be closing in a bit and I don’t know that there will be any substantial revelations two more miles up the road from where we are standing. My companions post up with an array of snacks. Succumbing to my weakness for high-country gravel and misty vistas, I push on solo to have a look around the next bend. The place is vividly reminiscent of the Icelandic highlands. Harsh, barren and primordial. It has been described as the closest thing to being on another planet. I’ve never been on another planet, so I can’t say for certain, but it sure does look cool. The clouds suddenly descend, forming a thick pea soup, dashing my hopes of visual gratification just around the bend. The real magic happens when you stop moving and just watch. The entirety of the sky is like plasma drifting in and out of focus. Presence and absence in flux. Changing. Shifting. Opening. Closing. The mountain revealing itself in tiny glimpses before disappearing again. The atmospheric interplay is mesmerizing. I could stand here all day but the mist quickly coats everything with a layer of moisture and it’s certainly not getting any warmer. 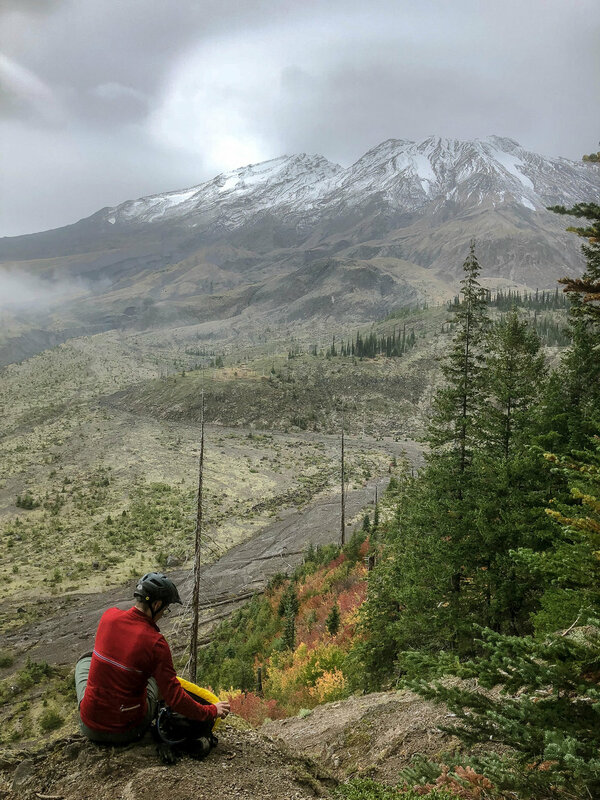 There is a larger, more rugged Smith Creek loop trail option that we would like to ride, but we will have to save that for another day. That said, the out-and-back version of the Plains of Abraham really shines in the downward direction, but not before some gamey climbing back up to the pumice plain. The pitchy bits and sand ladders are situated directly across from the St Helens crater, Dog’s Head and Ape Glacier so there is no shortage of opportunity to soak in the mammoth views we missed on the way out. Back in the saddle, the Abraham and Loowit trails descend like a fever dream back through the surreal expanse of the pumice plain. I think I’m starting to understand the appeal of this mountain bike thing as we float through swirling mists along ribbons of ash, sand and boulders. A slight drizzle develops. We stop to layer up before dropping back into the trees and the sheltered, flowing lines of Ape Canyon, a setting for which the plus format, again seems perfectly suited. The damp layer of pine needles provides a phenomenal level of traction in the corners. The hardtail has no trouble keeping up with its fully suspended brethren, save for the occasional root section, where I have to choose lines a bit more gingerly. Another aspect I hadn’t quite considered until this descent was the level of control afforded by modern hydro brake systems and 180mm rotors. Up to this point, all of my disc experience has involved mechanical or cable-actuated ‘hydro-hybrid’ brakes on more cyclocross-oriented 140mm rotors. The difference is night and day. The effortless stopping power allows much more brazen confidence, nuanced control and flat-out speed knowing how easily things can be reined back in. Between the suspension (120mm travel), 3” tires, head tube angle and hydro braking, descending takes on an entirely different dimension than I am used to. On one hand it’s faster, more aggressive, more intense and much more playful but at the same time everything feels drastically safer and more controlled than anything I’ve experienced in the rigid drop bar world. Again, so far so great! I fully acknowledge that I’m just now realizing what everyone else seems to have known for the past ten years, but it feels revelatory nonetheless. Like when I begrudgingly converted to tubeless…last year, only to find out it’s great. It is nice to finally embrace a niche I had discounted for so long, perennially underbiking on overstuffed roadish bikes with the justification that they were ‘basically drop bar mountain bikes’ but they never really were. As much as one wants to believe, copper will ultimately never be gold. I can definitely envision adding a plus hardtail to the lineup going forward. Particularly for steep, difficult terrain where drop bar handling, control and associated geometry becomes a liability. I guess that is the very reason ‘mountain bikes’ were invented, right? Sometimes one needs to arrive at a conclusion of one’s own accord. I think if I were able to pick and choose, I might like something, as I mentioned, with a bit more reach to find a good balance for longer rides with a fair amount of climbing. I also feel like you could go with a 2.8” tire and lighten things up a bit, but not sacrifice much in the way of cushy plus-size float. The carbon was admittedly nice in terms of weight, but I can imagine something in a lightweight steel would provide a more refined ride feel and take the edge off the rough stuff, adding comfort and reducing fatigue for longer days.